Dark jeans, black jeans, white jeans, gray jeans, pink jeans, skinny jeans, boot-cut jeans, jeggings, etc. Denim is everywhere for every style! This fall, you can’t go wrong with some pairs of denim pants. The only thing is you don’t want to look the same every day. Here is some inspiration for nice and different looks to try this fall! Add a tribal print blazer to your dark jeans with some statement jewelry. Perfect for an interview or work! 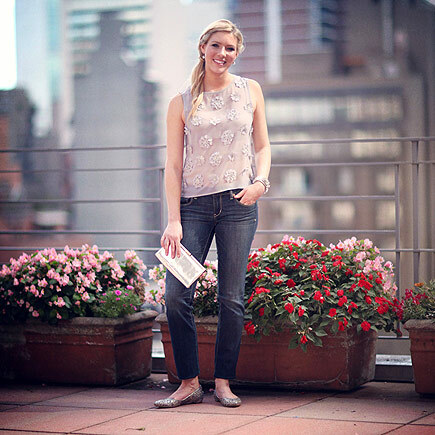 Put on a delicate top with feminine flats with your skinny jeans. Great for a date with the girls! Add a burgundy peplum top (this color is so in this fall!) with gray jeans, heels and a nice clutch. Perfect for your romantic date! Add a simple V-neck and a large sweater on top with a big bag and boots. Great for walking around the city! 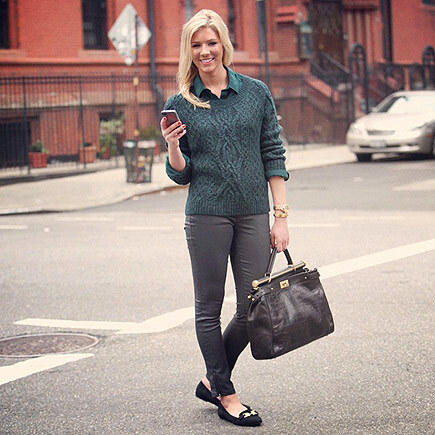 Jeans with a structured black bag, a hunter green blouse and sweater is a great outfit. (Hunter green is really in this season too) Nice for coffee with friends! Add a big bag, a simple sweater and a coat with your jeans and boots (and an umbrella if it’s raining!) Perfect for a shopping day! For mens, put on your jeans with layered shirts, sneakers and a cross-over bag. Perfect for the week-end! Also, put on a nice dress shirt (burgundy is also in for men, why not?) with washed jeans. Great for a dinner with friends!